The El Dorado County Board of Supervisors will conduct a hearing to consider the recommendation of the Planning Commission for approval for the El Dorado Hills Apartments project A16-0001 on Tuesday February 13, 2018 tentatively scheduled for 1:00PM in the Supervisors Meeting room at 330 Fair Lane, Placerville, CA. The Project seeks to gain four entitlements that will permit the project to move forward with two 4-story apartment buildings comprised of 214 apartment units, and one 5-story parking garage at the corner of Town Center Blvd and Vine Street. The property is currently zoned for commercial development. General Plan Amendment adding a new Policy (Policy 2.2.6.6) under Objective 2.2.6 (Site Specific Policy Section) to increase the maximum residential density allowed in the General Plan from 24 dwelling units per acre to a maximum of 47 dwelling units per acre specifically for the 4.565-acre project site within the TCE Planned Development area identified as Assessor’s Parcel Numbers 121-290-60, 61, and 62. El Dorado Hills Specific Plan Amendment incorporating multi-family residential use, density, and related standards for the project site. The project site would be designated as “Urban Infill Residential” within the Village T area of the EDHSP Plan. Revision to the approved Town Center East Development Plan incorporating multi-family residential use, density, and related design and development standards for the proposed 214-unit apartment project within Planning Area 2 of the TCE Plan area. Upon the release of the Final Environmental Impact report in December 2017, EDH APAC offered additional comments to the EDC Planning Commission and EDC Planning Services Dept. concerning both environmental, and non-environmental issues not addressed by the FEIR – the full response can be read HERE. On January 11, 2018 the El Dorado County Planning Commission reviewed the project and voted 3-2 to approve the project as proposed- with District 1 and District 4 Commissioners opposed. EDH APAC members feel that the Planning Commission, as well as the Final Environmental Impact Report, didn’t adequately address the major concern – a General Plan Amendment allowing the doubling of the 24 dwelling unit per acre multi-family residential standard to 47 dwelling units per acre for this project. EDH APAC members ask: if the standard exists, why is it reasonable to grant an amendment to double it? What benefit does it generate to the County, and more pointedly to El Dorado Hills? EDH APAC members see this as no minor variance. APAC members don’t see the benefit to the County or El Dorado Hills. The sole benefit is that the project applicant will get to build their project. EDH APAC members ask: Is this justification enough to amend the General Plan? EDH APAC members feel that the General Plan is a tool that exists to benefit El Dorado County residents, not as a tool to benefit a single development project, at the expense of residents. As to the merits of the debate if it is better to allow the project site to stay vacant, or to move forward with this current project as proposed, EDH APAC members counter that the original proponents of the Village T Town Center East Planned Development sought in the early 90s to get what they wanted, and now have – a commercial center, and were rewarded with zoning to that effect. EDH APAC members suggest that the impacts of failure to develop the parcel in their development as granted by the originally requested zoning, shouldn’t be forced to be borne by the El Dorado Hills community, or by the El Dorado County General Plan. Vacant or developed, the property has the zoning that was requested, and the ability to develop it rests with the owners, and the Town Center East Planned Development – if the project was seeking some simple, minor, modifications to develop the property, that would merit consideration – but a General Plan amendment is never minor. EDH APAC members don’t believe it merits a General Plan amendment based on the benefits it seeks for itself, in lieu of the lack of benefit to the County, and El Dorado Hills. Community members wishing to provide public comment or questions in support, or opposition to the project may submit those comments to the El Dorado County Board of Supervisors by Monday, February 12, 2018. Comments via email should be addressed the Clerk of the Board,a s well as to all five Supervisors, to be attached to the project file at the following addresses. 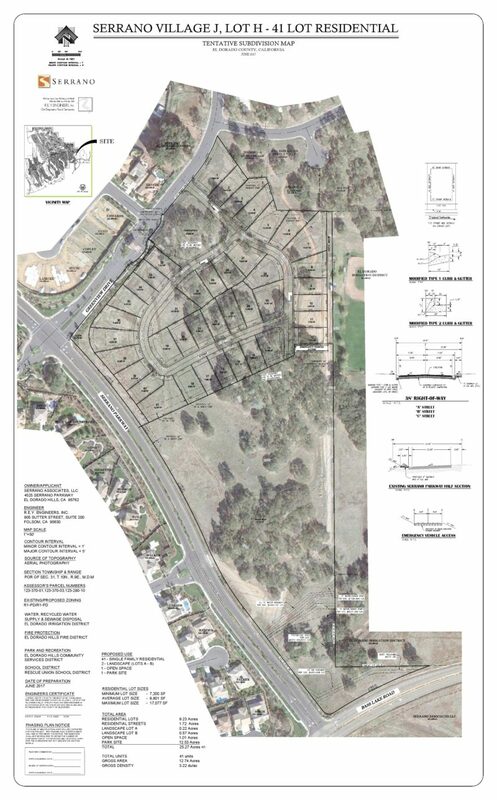 At the January 11, 2018 El Dorado County Planning Commission hearing, Commissioners approved the El Dorado Hills Apartments A16-0001 project by a 3-2 vote, and approved the findings for denial of the Saratoga Retail DR08-0003-R project. 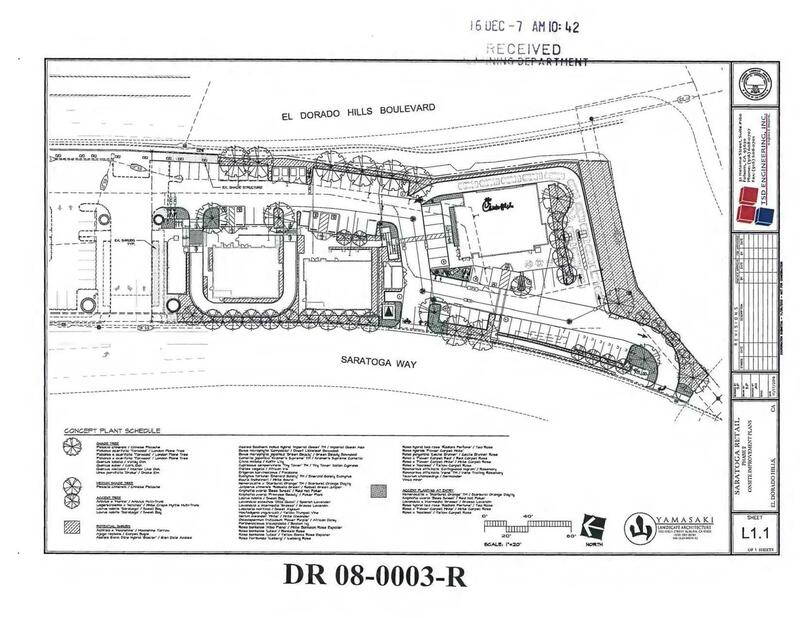 The Saratoga Retail project, originally approved in 2009 as the Shops at El Dorado Hills as a compromise between area neighbors, El Dorado Hills residents, El Dorado County, and the developer to limit the project to a Walgreens pharmacy with a drive thru for phase one, and phase two would consist of ’boutique’ shops in two buildings, that would serve the local neighborhood, as well as El Dorado Hills, and would not be ‘tourist drawing in nature’. The applicant sought to modify phase two by reducing overall square footage of phase two, but sought to add a third building, and two drive thru fast-food restaurants. The Planning Commission, after hearing from numerous residents in El Dorado Hills, decided to deny the project based on concerns regarding traffic/circulation, noise, aesthetics, environmental effects, and found that the project does not comply with the El Dorado County Zoning Ordinance’s parking requirements. The applicant can submit a revised project within 12 months, and additionally, has 10 days to appeal the ruling to the Board Of Supervisors. The El Dorado Hills Apartments project was approved on a 3-2 vote, with District 1 Planning Commissioner Jon Vegna, and District 4 Planning Commissioner James Williams voting against approving the project. The project is scaled down from a previously approved project on the site (that is currently appealing litigation that stopped the project). Instead of a 250 unit complex, it has been downsized to 214 units, in two 4-story buildings, with one 5-story parking garage in the center. EDH APAC submitted a recommendation of non-support for the project primarily based on traffic impacts, land zoning/use conflicts, the loss of future sales tax and transient occupancy tax revenues, the loss of retail/commercial space in the Town Center Planned Development, and a General Plan amendment, changing the voter approved El Dorado County General Plan standard for multi-family density from its current 24 dwelling units per acre, and essentially doubling it to 47 dwelling units per acre for this project. The project now goes to the El Dorado County Board of Supervisors for final approval. El Dorado County residents can still submit public comments, questions, and concerns, either supporting or opposing the project, to the Board of Supervisors. The hearing date for the project has yet to be scheduled. 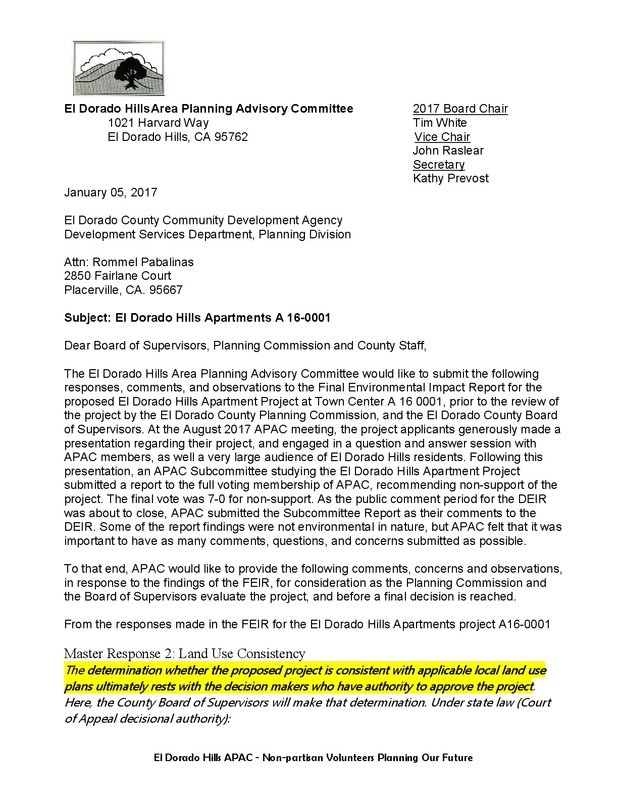 The El Dorado Hills Area Planning Advisory Committee submitted response comments regarding the El Dorado Hills Apartments project A16-0001 to the El Dorado County Planning Commission in advance of their January 11 2018 project hearing. The Project seeks to gain four entitlements that will permit the project to move forward with two 4-story apartment buildings comprised of 214 apartment units, and one 5-story parking garage at the corner of Town Center Blvd and Vine Street. The property is currently zoned for commercial development. It had previously been proposed to develop a hotel project on the site. In studying the project, EDH APAC volunteers were concerned with issues regarding the traffic impacts, loss of commercial space and associated employment opportunities, sales tax loss, transient occupancy tax loss, non-compatible land use and conflict with the 1988 El Dorado Hills Specific Plan, and conflicts with the Voter Approved El Dorado County General Plan regarding a general plan amendment seeking to change the current multifamily residential density standard from a maximum of 24 dwelling units per acre, to 47 dwelling units per acres for this project. The January 11 2018 meeting of the El Dorado County Planning Commission will feature the return of two El Dorado Hills Projects as separate hearings for Planning Commission approval. The Planning Commissioners will consider Findings for denial for the Saratoga Retail project DR08-0003-R, that was conceptually denied by the Planning Commission on December 14, 2017. Commissioners will be voting to accept the Findings for Denial as presented by County Planning Staff. This project is a Design Review Revision, seeking to alter the original 2008 approved plan, by reducing over-all building square footage, and splitting the previously approved two buildings (buildings 2 and 3) into 3 buildings (buildings 2A, 2B, and 3 ) and adding two drive through fast food restaurants. 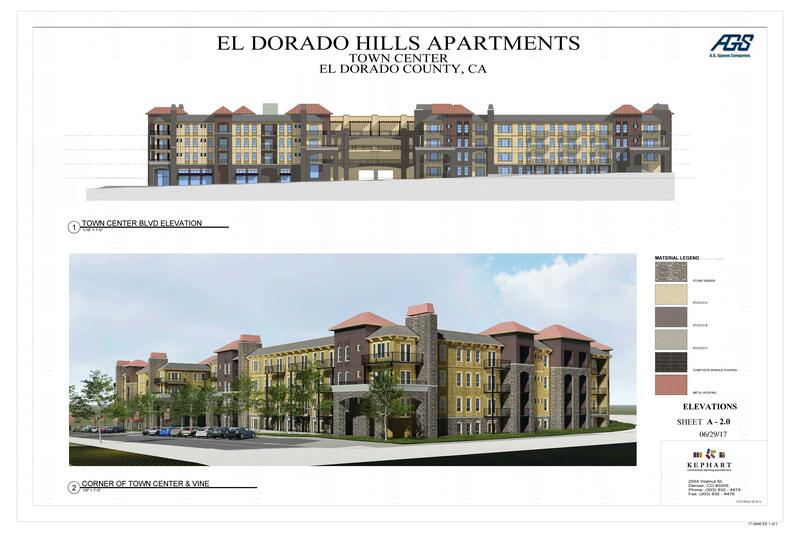 For the second El Dorado Hills project, the the Planning Commissioners will conduct a hearing to consider the El Dorado Hills Apartments project at Town Center East: A16-0001, Z16-0004, SP86-0002-R-3, PD94-0004-R-3. This project was continued from the December 14 2017 meeting at the request of the project applicant, the EDH APAC, and area residents, to allow additional time to fully review the project Final Environment Impact Report. This project is seeking approval to construct a 214 unit apartment complex, comprised of two 4-story apartment buildings, and a 5-story parking garage at the corner or Town Center Blvd and Vine Street. The project originally approved by the commission in 2009 includes three commercial buildings totaling 30,628 square feet. Divided into two phases, Phase I consisted of the construction of a 13,263-square-foot building now occupied by Walgreens. On Thursday the developer was back for approval of a modified Phase 2. Instead of two more commercial buildings, the revised plans included reducing the square footage of the commercial building by 6,907 square feet and constructing two drive-thru restaurants to be occupied by Chick-fil-A and Habit Burger. LaRue reiterated he was only requesting a minor modification to the original design and that should have required a staff-level decision rather than a public hearing. At the same time he promised to build the best development possible — one that would hopefully be enjoyed by people in the future. Seeking some kind of compromise, District 1 Commissioner John Vegna asked if LaRue would meet with the homeowners to hammer out a “win-win.” Williams also asked if the developer would consider downsizing the project. LaRue said he didn’t want to downsize the project any more than had already been done. After planners conceptually denied the design modification they asked staff to return to the Jan. 11 meeting with the findings of facts as to the reasons for the denial with traffic being the main sticking point. The developer has the option of appealing the decision to the El Dorado County Board of Supervisors after the planners make their final decision in January. The Planning Commission has directed County Staff to prepare findings to support their denial vote. 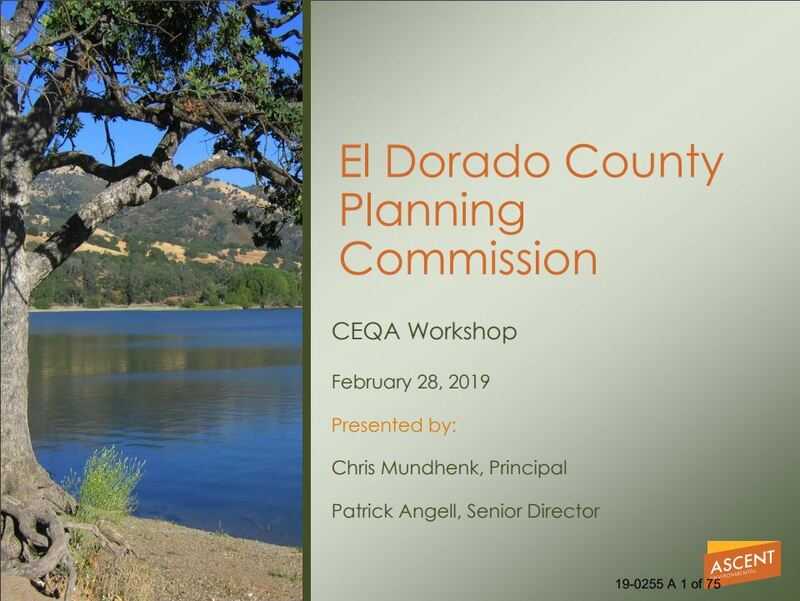 The Project Applicant can appealing the findings to the El Dorado Count Board of Supervisors after the Commission has published their findings in January 2018. Another project with a hearing at the same Planning Commission meeting was approved 5-0 by the Planning Commissioners. The Pavilions Memory Care project will create a 64 bed facility providing care for dementia and Alzheimer’s patients. Residents expressed concerns about mitigation measures for Oak Tree loss on the project, but several commentators agreed it would potentially be one of lower impact projects possible for the site. The Village Life published an article with more details. Also scheduled for the same Planning Commission meeting, the hearing for the El Dorado Hills Apartments at Town Center was granted a continuance until the January 11 2018 Planning Commission Meeting. The Five hour, thirteen minute meeting is available as an audio recording on the County Legistar website. When available, meeting minutes will be posted to the APAC documents page. The El Dorado Hills Area Planning Advisory Committee has asked for a continuance of the Planning Commission Hearing regarding the El Dorado Hills Apartments at Town Center East, to allow time to review the Final Environmental Impact Report (FEIR), released to the public on Wednesday, December 6, 2017. The Notice of Public Hearing issued by El Dorado County November 13, 2017 indicated that all relevant Staff Reports and documents would be available for public review 14 days before the scheduled December 14, 2017 hearing date. The EDH APAC believes that issuing the FEIR with only 8 days for public review, as well as neglecting the Notice of Public Hearing’s promise of documents being available 14 days prior to the hearing, wouldn’t allow adequate time for a thoughtful, thorough, review of the 210 page document, nor was it keeping in the spirit of El Dorado County’s commitment to transparency and good governance. This request for rescheduling is not made with respect to the merits of the Project, but solely with respect to the scheduling of the Project for hearing on December 14, 2017. Specifically, the FEIR for this Project was not posted on the EDC Planning website until Wednesday, December 6, 2017, just 8 days before the scheduled hearing. As you know, during the review process on a project, most people only read and make comments on the DEIR during the 45 day time required by law- when a FEIR is available people typically review that document to see how their comments were addressed by the Planning Department. In final, 8 days to review the 200+ pages of the FEIR for the Town Center Apartments Project is an inadequate period of time- it flies in the face of transparency, in full and timely disclosure, and in good governance. There were also requests from El Dorado Hills residents seeking additional time to review the document. We understand that the County has received comments from the El Dorado Hills Area Planning Advisory Committee (EDHAPAC) and at least one individual, which request postponement of the hearing to allow for additional time for public review of the Final Environmental Impact Report (FEIR) prepared for the project. Although we understand that there is no legal requirement to postpone the hearing as a result of these requests, we respectfully request that the hearing be continued and placed on the agenda for the Commission’s next meeting, on January 11. We are making this request because of our commitment to ensuring the public and the County are fully informed of the project’s benefits and impacts (including environmental impacts), before any action is taken by the County on the project. Deferring the hearing until January 11 will effectively extend the public review period by approximately four weeks, thereby ensuring that EDHAPAC, local community members, and other interested persons are afforded ample opportunity to review the FEIR and all other project-related materials that have been posted to the County’s website. We believe that this extended review period will facilitate active and informed participation by the public at the hearing, as well as informed decision making by the Planning Commission. This approach is consistent with our and the County’s efforts throughout this process to be proactive in soliciting and addressing community feedback. 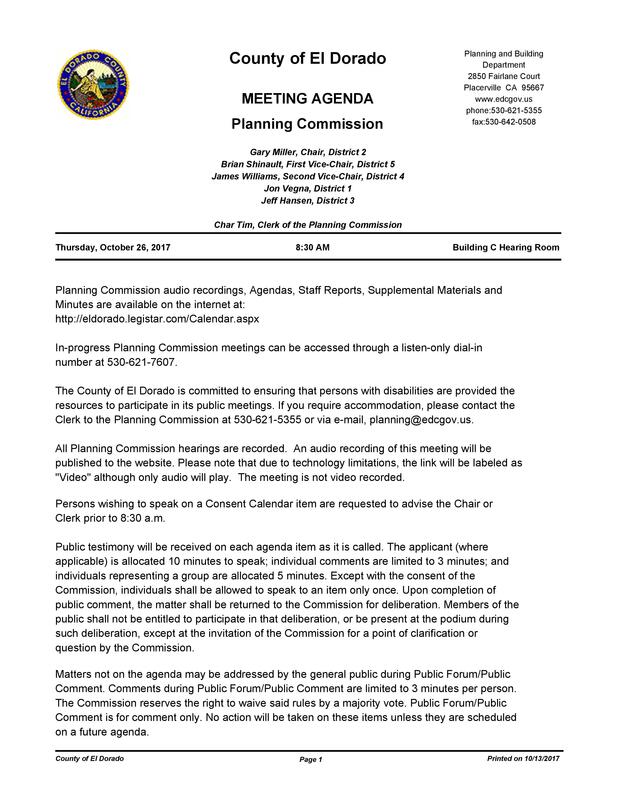 This morning, on December 11, 2017, the County of El Dorado has placed the applicant’s request for continuance on the Planning Commissions’s legistar project file – the Planning Commission will address the request for continuance at the scheduled December 14, 2017 Planning Commission Hearing. In advance of the Planning Commission’s finding, EDH APAC asks that area residents continue to submit their concerns, questions, and suggestions for the project for Planning Commission, and Board of Supervisors consideration.